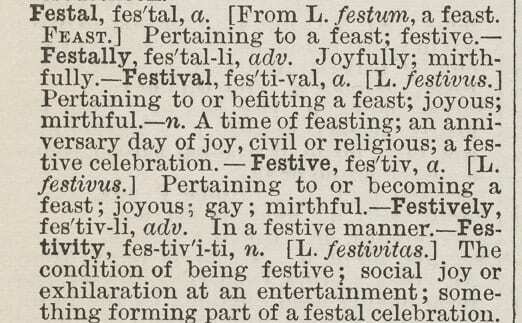 For the final definition in our seasonal list, it seemed appropriate to talk about festivals and feasts. The definition above has changed very little over the centuries and reflects the joyous, positive and entertaining nature of the word. It was only a brief step from that warm feeling to a seasonal reflection on the work of Special Collections over the past year. The advent definitions project perfectly sums up the motivations of the Special Collections team – to take wonderful, rare or unique books and archives and shine a light on their importance and relevance to the modern day. We do this through our collection managers, who have built and grown these wonderful collections; our cataloguers, who create the resources to make these rare items available; our conservation team, who mend and preserve our unique material; our reading room teams, who provide the space and expertise so that researchers can enquire about and consult the items; our digital curation team, who digitise the items for preservation and online access; and our outreach team, who work with academics and the general public to make everything available in a myriad of ways. From the whole team, we wish you a very merry (and of course festive) Christmas.